Implementation of e-office Lite (SPARROW) and PIMS for CBIC employees- issuance of instruction for the Officers and Staff- reg. FINAL SENIORITY LIST OF INSPECTOR(Examiner)- Reg. FINAL SENIORITY LIST OF INSPECTOR(PO)- Reg. Implementation of E-Office (SPARROW) and PIMS for CBIC employes- Reg. F No. S9/01/2018 — Estt. Instructions with regard to Training programs for officers/staff - Reg. Instructions with regard to availing of EARNED LEAVE- Reg. Draft combined Seniority/Eligibility List of Inspectors (Examiner) - Reg. International Customs Day Celebration 2019-Nomination for award of 'WCO certificate of Merit- Reg. Cash Awards to Departmental Officials for innovation in the field of Data and other areas of work/responsibilities within CBIC- Reg. Submission of Immovable Property Returns by Group 'A, '13, 'C' & erstwhile Group 'D' Officers for the year 2018 (as on 01 .01.2019) - Reg. Cash Awards to Meritorious Children of staff - Reg. F No.F No. S1/01/2018 — Estt. The 9th English-speaking Session of the Virtual Customs Orientation Academy(VCOA) from 4th Mar,2019 to 7th June,2019 - Reg. F No. S1/01/2018 — Estt. 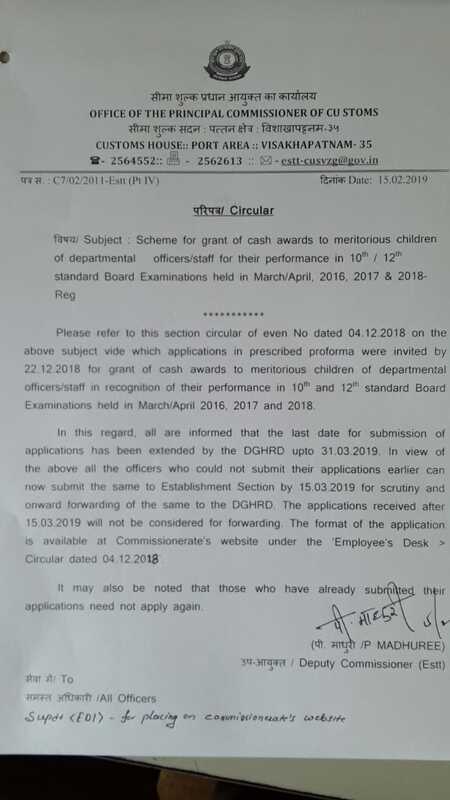 DPC for the year 2019-20 for promotion to the grade of Appraiser on regular basis — Willingness called for from Inspector (Preventive officer) - Reg. F.No. S17 / 01 / 2015 —Estt(I). Insspection of Customs Commissionerates- Reg. F.No. S2 / 11 / 2018 —CBS. Renewal/Validity of F / G / H Photo Identity Cards Issued Under Customs Brokers License - Reg. F.No. SlO /40/2009 —(Bldgs)Prev., Pt. IV. OBSERVANCE OF VIGILANCE AWARENESS WEEK-2018- QUIZ COMPETITON -Reg. OBSERVANCE OF VIGILANCE AWARENESS WEEK-2018-Reg. Declaration of details of Income & Savings for calculation of Income tax for 2018-19-Reg. Vacancy Deputy Director(Gr.A5) in the Compliance and Facilitratoin Directorate at WCO-Reg. cALL FOR NOMINATIONS FOR Master Degree Programmes by Lee Kuan Yew School of Public Policy-Reg. Presidential Awards of Appreciation Certificates to be announced ongthe occasion of the Republic Day,2019-Reg. Draft Seniority List in the cadre of Inspector(PO) as on 25-09-2018-reg. Nomination for All India workshop to be organised NACIN,Hyd-reg. Procedure for adjudication of cases-Reg. Establishment order No.33/2018 : Nomination of liasion officer for SC/ST/OBCs/PWD for Custom House, Visakhapatnam-Reg. Nomination for Trainig programme organised by NACIN,Bangalore-reg. Declaration of Half a day holiday on 17-08-2018 on account of demise of Shri Atal Bihari Vajpayee, Former Prime Minister of India-Reg. Maintenance of Cash Declaration Register in Sensitive Areas-Reg. APAR of Officers - Note reg. Establishment-Preparation of panel of Air Customs officers for posting at Anna International Airport, Chennai-reg. Establishment-Preparation of panel of Air customs Superintendents for posting at Anna International Airport, Chennai-reg. Declaration of details of Income & savings for calculation of Income Tax for the finance year 2017-18.-Reg. Monitoring of delay in filing of SLPs/Appeals by the department before the Hon'ble Supreme Court/High Courts-Reg. Establishment-Preparation of panel of Air Customs Superintendent for posting to Trivandrum International Airport,Trivandrum-Reg. Online writing of IPR for IRS(CCE) officers of CBEC-Reg. Award for Excellence in Public Services-Reg. Need to Sensitization the international Passengers regarding ban on bringing of Satelite phones in India-Reg. Sensitization on compliance of IT Act,2000 and Aadhar Act,2016 while data sharing in the departmental websites-Reg. Request for termination of Customs Bonded Truck from Visakhapatnam through Gateway Airports by M/s T.T. Aviation Handling Services Pvt. Ltd.,Chennai-Reg. Publication materials for Departmental Magazine "Vizag Pearl"